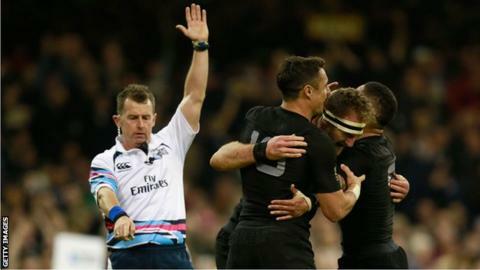 Nigel Owens will referee Saturday's World Cup final after being selected by tournament organisers World Rugby. The 44-year-old will be the second Welshman to take charge of a final following Derek Bevan, who was in charge in 1991 when Australia edged England, also at Twickenham. Owens said on social media that he was "truly humbled and honoured". New Zealand beat South Africa 20-18 on Saturday and face Australia, who overcame Argentina 29-15 on Sunday. The two southern hemisphere rivals have never faced each other in the final. England's Ed Morrison, at the 1995 final between South Africa and New Zealand, and Irishman Alain Rolland, who officiated the England versus South Africa 2007 final, are the other northern hemisphere officials to have refereed rugby union's showpiece event. New Zealand selector Grant Fox had already suggested that Owens would be in charge at Twickenham on 31 October. Former All Blacks fly-half Fox told New Zealand radio station Newstalk ZB: "We knew... that he had that job should we get the opportunity to play in that game [the final]. "Nigel is clearly the best referee in the world - he's demonstrated that. Owens is the subject of a BBC Wales television programme to be shown on Monday. In it the Welshman says the speed of the game and instant replays in stadiums add to the scrutiny on officials. "The game has gone quicker, so your decision making has to be even better and quicker," Owens said. "The pressure on you as a referee is massive. You have less time to make your decision in that split-second. "And in every stadium now there is a big screen, every decision you make is highlighted now. There are more cameras at the games now, there are more players viewing the game and watching it at home. "When you look at that screen and then you make the wrong decision there is no excuses, people will not forgive you." The programme was recorded before the World Cup, but provides an insight into the controversy surrounding fellow referee Craig Joubert during the tournament. The South African awarded Australia the penalty which clinched a 35-34 victory over Scotland in the quarter-final. Replays suggested Joubert made a mistake and World Rugby - the sport's governing body - said the referee's decision was incorrect. World Rugby chief executive Brett Gosper has also defended Joubert: "Craig Joubert is a superb referee and has been for a long time and he's a good man. "There will be reasons for whatever Craig did. We do a full review of the referees post-game, and that process is underway at the moment." England's Wayne Barnes has also been criticised for his decision to sin-bin Argentina lock Tomas Lavanini for a clumsy low tackle on Australia's Israel Folau during the Wallabies' semi-final win. Adam Ashley-Cooper's match-securing hat-trick try came from a pass that television pictures suggested could have been forward, but no replay was called for by the match officials. Owens believes the best referees are the ones who can strike a balance between applying the laws of the game and allowing matches to flow. "You've got to get the balance right in between and that is what sets, I think, the referees who make it to the top and stay there," he said. "What sets them apart is the ability to get that balance of knowing when to blow the whistle and probably more importantly knowing when not to blow the whistle. "Anybody can go out on the field and blow a whistle - referee the laws of the game and blow a whistle - but I'm afraid if you're going to do that you're not going to have a game." In the programme, Owens also discusses coming out as gay and a failed suicide attempt when he was 19 years old. In 2007, Owens came out live on a Welsh-language television programme hosted by former Wales captain Jonathan Davies. A year later Owens published an autobiography in Welsh in which he revealed that he made a suicide attempt while suffering from depression. He also suffered from bulimia and became addicted to steroids during that period of his life. "My dirty linen I guess from those dark times is out there in the public domain... and everybody knows these personal things makes it okay really because it's helping people," he said. Nigel Owens - True to Myself, is on BBC One Wales at 22:35 GMT on Monday, 26 October and available afterwards on the iPlayer.